Sessions choose to project “a moving wallpaper that adds to the focus on the stage,” and limited his projections to the wall directly above and behind the chorus. The production did not include either supertitles or a printed libretto, so the video component helped to illustrate Haydn’s word tone painting and to support the progress of Haydn’s seven “days.” Some of Sessions’s most successful images took advantage of the verticality of the decorative organ pipes, which were modeled on the organ housed in the chapel of Santa Maria della Scala Hospital in Siena. A simple rising sun described by the angel Uriel (“In splendour bright is rising now,” during the fourth day) ascended through the 20 feet and came to rest in a way that emphasized the circular placement of sculptures adorning the organ pipes. The first half of the program featured abstract, mostly primary-color images constructed by Sessions, whereas the second (the fifth through seventh days of creation) employed loops of representational images evoking birds and animals in motion. Burleigh, who also conducts the renowned Mendelssohn Choir (Pittsburgh) and the Providence Singers, led the combined musicians with grace and efficiency. The choral finales to days three (“The Heavens are Telling”) and six (“Achieved is the Glorious Work”) were some of the most dramatic and nuanced choral singing I have heard in Jordan Hall. Burleigh chose to have the singers stand “hashed” (sopranos/basses mixed on stage right and altos/basses mixed on stage left) and achieved an excellent blend. Although the chorus held scores, they didn’t seem to need them. The most exciting moments were those sections in which the full power and majesty of the voices were unleashed, still displaying nuanced phrasing and recalling the later choral finales of Haydn’s student Beethoven. The final ensemble crescendo was especially well controlled in the sopranos, joined by soloist Mary Wilson. It is clear that Burleigh draws from years of experience as a preparer of choruses (from her work with the Pittsburgh Symphony), and her conducting seemed to confirm what she had meticulously prepared the chorus to sing, rather than to (re)interpret the work from the podium in performance. However, her conducting of the accompanied recitatives was particularly inspired, with crisp gestures demanding a huge range of dynamics, articulation, and rhythmic precision from the Boston Philharmonic players. The secco recitatives were mostly not conducted, and harpsichordist Paul Ciennewa led the continuo group in those instances. Standouts among the instrumentalists included the double reeds in day six (especially principal oboist Peggy Pearson and contrabassoonist Margaret Phillips) and principal clarinetist Jan Halloran throughout. Bass-baritone Paul Guttry interpreted his dual roles as the Angel Raphael and Adam more like a Bach evangelist, with meticulous attention to diction and declamation, but at times he was overmatched by the lower strings in his arias. Haydn had recently heard Handel’s oratorios performed when he began The Creation, and Guttry shone in those recitatives (“And God made the firmament”; “And God said: Let the waters”; “And God created great whales” ) that most closely echoed Handel’s delicate writing for high baritone. Tenor Zachary Wilder shone in trios and as the Angel Uriel, bringing a variety of color and focus to the contrasting “sun” and “moon” music. His expressive, flexible singing of the sixth-day recitative “And God created Man,” was complemented by the moving solo played by Principal Cello Velleda Miragias. Soprano Mary Wilson was the star of the evening, displaying impeccable technique and perfectly focused tone as the Angel Gabriel in the difficult “With verdure clad” aria from day three. She used vibrato sparingly in this role, soaring above the full orchestral strings throughout the third and sixth days, and employing the only Baroque ornamentation of the evening. As Eve, she used a more classical operatic sound, but she scaled back in the three extended Duets with Adam. 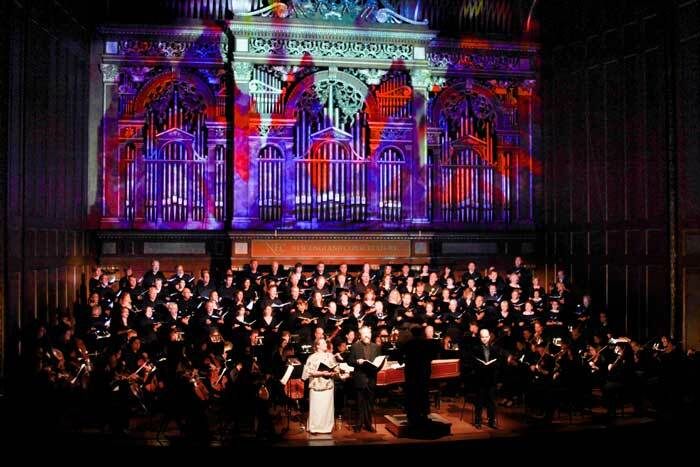 Throughout the evening, the audience responded audibly to both the video projections and to the music, ending with a five-minute standing ovation while Burleigh acknowledged notable soloists from the orchestra. This was followed by one minute of applause focusing on Chorus pro Musica, but it wasn’t enough. Not nearly enough. Laura Stanfield Prichard is a regular pre-concert lecturer for Boston Baroque, the Berkshire Choral Festival, and the Chicago and San Francisco Symphonies. She sings with the Tanglewood Festival Chorus and has recently edited eight orchestral scores for Musikproduktion Höflich in Munich.